No matter what we aspire to, we need some real honest-to-goodness heroes to inspire us along the way. Our spiritual life is no different. Where you might have plastered your bedroom walls with posters of Michael Jordan or Jimi Hendrix (or in my case Mikhail Baryshnikov) to fuel your pursuit of greatness in your youth, you need to know who your bodhisattva heroes are on your spiritual path. 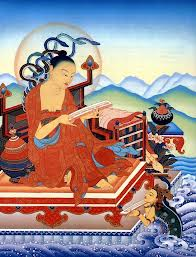 A bodhisattva is a warrior saint, one who is fixed on achieving the ultimate spiritual goals of this life, for the benefit of others. Look for their stories, find the ones that come to life for you, and return to them when your practice needs some juice to keep going. Go ahead and put up their posters! I can think of a certain someone I know whom I like to think has a picture of Arya Nagarjuna – undefeated heavyweight champion of Buddhist emptiness – up in his locker at work. Perhaps this will be a continuing series here, and I’ll issue Bodhisattva trading cards – mix ’em, swap ’em, trade ’em, and collect ’em all! 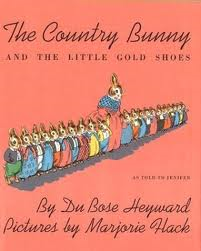 If its Eastertide, I know it must be time for me to revisit one of my most loved bodhisattva heroes – Little Cottontail Mother, from “The Country Bunny and the Little Gold Shoes”, by DuBose Heyward (illustrations by Marjorie Flack). I was drawn to this book when I was a kid. As I raise my own daughter, I find the Dharma in so many children’s books, and this one is no exception. Little Cottontail’s story has some intriguing parallel’s to that of the Buddhist deity Green Tara. Neither heroine is swayed from their virtuous aspirations despite being discouraged from attaining these goals as women. In fact, they both reach the goals through a uniquely feminine expression. And both have twenty-one helpers. Did you know that there is not one, but five Easter Bunnies? They must be the kindest, the swiftest and the wisest of all the bunnies. When one gets too old for the job, Grandfather Rabbit chooses a successor. Every little bunny dreams of growing up to be an Easter Bunny. 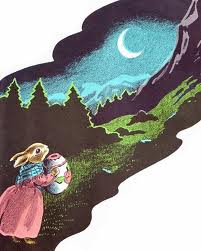 Little Cottontail shares this dream, though she is ridiculed by the fancy white and big, strong jack rabbits. Then one day, much to her surprise there were twenty-one Cottontail babies to take care of. She turns her attentions to raising her babies (did I mention she’s a single mother?). But when they are grown she tells them, “now we are going to have some fun”. Each of her twenty-one offspring is given a job in taking care of their home and family – cooking, cleaning, mending, gardening, making music or pictures. She is to carry this egg to a sick boy at the top of an icy peak, over two rivers and past three mountains. She makes the arduous journey, but just before reaching the summit, slips, tumbles and injures her leg. Still she tries to get up to complete her task, as the sun is rising and she knows how sad the little boy would be without his egg. Grandfather Bunny appears to help her, proclaiming her not only the wisest, kindest, and swiftest, but also the bravest bunny, and gives her a pair of magical gold shoes. With these she alights and delivers her treasure. You know those days when, if everything works like you’ve planned it, if every traffic light cooperates, you just might get everything you need to done and make it to the daycare on time for pickup? Those are the times my friend April quips, “where’s my cape?” I take my inspiration from Little Cottontail. She is a shining example of virya, or the Perfection of Joyful Effort. She models this goodness for her children, too. Household chores are fun, and everyone has a contribution to make – the ones who paint pictures to pretty the place up are as important as those who make the beds. In the colourful retro illustrations, you can fairly see their home gleam, and hear the music and laughter that must fill the air of their country cottage, where they “never have a tear or cross word”. When her path becomes rough, and almost too much to bear, she rises up, powered by her consideration for another, by her bodhicitta. In that moment, she experiences the grace that allows her to attain her goal. So…. who are your spiritual heroes? How can you see their goodness reflected in your own heroic story? 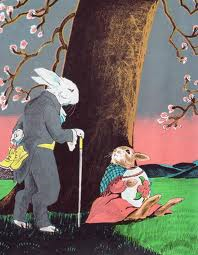 But if you’ll please excuse me now – the hour is growing late, and I have some Easter eggs to deliver…. HAPPY BIRTHDAY ASIAN CLASSICS INSTITUTE! Tonight in New York City, ACI celebrates 20 years of sharing the Dharma, in freely offered courses, with modern translations of ancient texts that make wisdom accessible and relevant to our lives today. 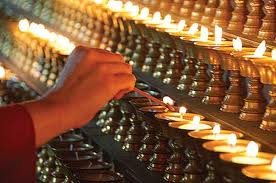 Over 300 teachers worlwide have continued what Geshe Michael Roach started. Immense gratitude to Geshehla, for this priceless gift. Special thanks to Lama Cliff Spencer for his kindness in teaching all 18 courses of the ACI curriculum. Thank you to all the precious teachers who have taught ACI curriculum here in Toronto – David Gluck, Jeannine Woodall, Kimberley Theresa Lafferty, Ted Lafferty, Venerable Alistair Holmes, Anita Soutendam and Shadi Mogadime. Of Your leisure and fortune. For more information, visit http://www.acidharma.org.